a disc jockey (also known as dj or deejay) is a person who selects and plays recorded music for an audience. many modern djs add electronic effects to their dj sets relying on existing samples of other djs/music producers. some djs produce their tracks live at the club. and then there is beardyman, a beat box guru, who produces whole dj sets constructed live from his vocalisations only, using looping effects. he usually makes heavy use of korg's kaoss pads. Is Nature continuous or discrete? Physics and philosophy: How does one help the other? why does anything exist ("why is there something rather than nothing? for nothingness is simpler and easier than anything" - von Leibniz)? what is the origin of everything? what is the nature of time (fundamental or emergent, an illusion, arrow of time and the low entropy of the early universe, ...)? what are laws of nature? why is there a structure-forming and self-organizing process and how did it arise and how does it function? why is complex behaviour the result of simple rules? are there transcendental, "supernatural" or psi phenomena, or: is there an non-physical level of reality? is there a unifying "theory of everything" to be discovered? is there a theory of quantum gravity to be discovered? why does macro-reality appear so well-ordered whilst the quantum realm is so bizarre (non-locality, observation/measurement, uncertainty, duality, entanglement, delayed choice, superpositions, probabilistic nature, ...)? will there ever be a conclusive interpretation of quantum theory? why (special) relativity (alternatively: why a constant speed of light)? is space and time quantized? is reality intrinsically finite, or: does infinity really exist outside the human mind? does a physical higgs boson exist (my conspiracy theory says no;-)? why a big bang and an expanding universe? at what point in the evolution of the cosmos did the possibility of life (and consciousness) first become apparent? why are scaling-law relations and distributions ubiquitous in complex systems? why were the attempts to found science on common sense notions (as seen in the programs of logical empiricism and critical rationalism) unsuccessful? do the clay institutes' millennium problems have solutions? what is the mind matter link? why the correspondence between inner and outer reality (the mind's ability to devise formal thought systems and the universes propensity to be described by them, e.g., wigner's unreasonable effectiveness of mathematics) or: why has science been so fantastically successful at describing reality? why is science producing amazing technology at accelerating speed? does any non-physical entity or information content continue to exist after physical death? what about (temperature- or chemically-induced) suspended animation? what is the biological basis for aging and what determines the lifespan of healthy organisms (longevity)? is there a model of the mind or theory of the brain to be discovered? does a true mystical or enlightened state of mind exist? why information processing (from dna to consciousness and computers)? is there a meaning to existence? is there a creating or omnipotent entity? are there absolutes (e.g., good and evil)? why is life so improbable (fine-tuning of physical constants, birth of stars, supernovae fusing heavy elements, carbon's unique bonding properties, right temperature conditions, anomalies of water, ...)? were the dozen or so extinction events in the history of life imperative for the emergence of humans? will the amount of suffering experienced by living creatures on earth ever decrease? will the human race ever reach a level of sustainability with the environment? will the human race ever manifest collective intelligence? will theology ever be superseded? well i think the people who would benefit most of all are professors. i think it would be extremely good for almost anybody with fixed ideas and with a great certainty about what's what to take this thing and to realize the world he's constructed is by no means the only world. that there are these extraordinary other types of universe. aldous huxley on psychedelic substances. is climate change a threat? does global warming exist? is co2 the driving factor? or is it all just an elaborate hoax? but taking a step back first, what can we know? what is science? what are laws of nature? and what can be said for certain when addressing these issues? without wanting to bother with the philosophy of science (e.g., problems of logical empiricism and critical rationalism), any knowledge about the nature of reality is never certain. 100% certainty is not what science is about. its a process adapting in the face of new observations or insights. furthermore, i think being sceptical is a very sane approach to life. and i find alarmism and scaremongering very unhelpful and misguided strategies. finally, topics that continuously get hyped in the media tend to become very boring very quickly. i am very willing to consider the possibility, that there has been fraud, incompetence, an existing hidden agenda, exaggerated alarmism, and an environmental ideology in the climate activist camp. however, i would also assign a similar level of fraud, incompetence, existence of conspiracy theories, denial, and political ideology driving climate scepticism. considering the possible distribution of deceitful human beings in the population, i would be very surprised if they all turned out to be climate activists or climate scientists. so, how to see through the misinformation and rationally try and get to the reality of the situation? well, i think this is actually quite easy. need to know stuff about cern and higgs bosons? ask a particle physicist. need to understand things about the climate? well, ask a climate scientist. and as climate scientists represent one of the biggest scientific communities (http://www.youtube.com/watch?v=QlyorcJ28UA) this should be easy. It seems that the debate on the authenticity of global warming and the role played by human activity is largely nonexistent among those who understand the nuances and scientific basis of long-term climate processes. This newspaper believes that global warming is a serious threat, and that the world needs to take steps to try to avert it. That is the job of the politicians. But we do not believe that climate change is a certainty. There are no certainties in science. Prevailing theories must be constantly tested against evidence, and refined, and more evidence collected, and the theories tested again. That is the job of the scientists. When they stop questioning orthodoxy, mankind will have given up the search for truth. The sceptics should not be silenced. so, what is the problem then? i have a big problem when a whole community of scientists gets successfully branded in the public opinion as a bunch of lying, incompetent, alarmist and fanatically driven people producing nothing but pseudo-science in an ongoing global effort to dupe the public. the tactics with which this was achieved (e.g., discredit the scientists and the science, imply that there is an hidden agenda and ideological motivation, conjure up conspiracy theories, select people with no professional training in the subject as public spokespeople, pay public relations firms and lobby groups to instil a sense of uncertainty and confusion in the public, promote obscure ideas and fringe theories, ...) painfully remind me of creationism. and although many of the sceptic claims have been debunked, they continually reappear, just as if ignoring one thing and relentlessly repeating an other thing makes it true. Just 57 percent think there is solid evidence the world is getting warmer, down 20 points in just three years, a new poll says. And the share of people who believe pollution caused by humans is causing temperatures to rise has also taken a dip. in effect, the sceptics offer no alternate hypothesis to the issue and are basically just saying "no, you're wrong". Scientists will continue to monitor the global climate and the factors which influence it. It is important that all legitimate potential scientific explanations continue to be considered and investigated. Debate will continue, and the Royal Society has just hosted a two day discussion meeting attended by over 300 scientists, but it must not be at the expense of action. Those who promote fringe scientific views but ignore the weight of evidence are playing a dangerous game. They run the risk of diverting attention from what we can do to ensure the world's population has the best possible future. by martin rees, cosmologist and president of the royal society (see an inspiring talk on cosmology, complexity, and the future perspectives of humanity here: http://www.youtube.com/watch?v=3qF26MbYgOA), in a response to the documentary "the great global warming swindle"
so to conclude, sceptical, yeah, unscientific, no. i often marvel at the emergent collective intelligence of ants, an assemblage of pretty unintelligent individuals, to form an adaptive, self-organizing superorganism, living in a sustainable balance with its environment. having said this, i find it one of the most perplexing observations, that individual intelligence appears to hinder the emergence of collective intelligence, as demonstrated by the human race and its relationship with the environment. "Stratospheric water vapor concentrations decreased by about 10% after the year 2000. Here, we show that this acted to slow the rate of increase in global surface temperature over 2000 to 2009 by about 25% compared to that which would have occurred due only to carbon dioxide and other greenhouse gases." "How come a big ice age happened when carbon dioxide levels were high? It's a question climate sceptics often ask. But sometimes the right answer is the simplest: it turns out CO2 levels were not that high after all." "CO2 emissions from the burning of fossil fuels are the primary cause of global warming." "For the first time, a causal link has been established between climate change and the timing of a natural event – the emergence of the common brown butterfly." "We have already overstepped three of nine planetary boundaries and are at grave risk of transgressing several others"
"Each week State of Flux will be featuring images of different locations on planet Earth, showing change over time periods ranging from centuries to days"
An important new forum to promote cross-disciplinary discussion of a global phenomenon with long-term societal implications. An authoritative, encyclopedic resource addressing key topics from diverse research perspectives. "Perhaps the most astonishing allegation we face is that climate science is a grand conspiracy of thousands of scientists in many countries." "Science needs to fight back, but not just by attacking its critics. Scientists need to reclaim the badge of "scepticism". They need to show that although the essentials of global warming are settled, the field itself is alive with debate and revision, as all science should be. They need to tell the public that there are things in the science that are open for debate, even if those things do not detract from the case for action." "The Internet was abuzz with a quote from Professor Phil Jones that there has been no global warming since 1995. But is that what he actually said?" "Secretary-General Ban Ki-moon has ordered a newly formed outside scientific panel to review its [the IPCCs] "procedures and practices" -- and more significantly, its management." "New administrator and marine biologist Jane Lubchenco hopes to explain what scientists do and do not know via the government agency's new climate service"
"Ocean acidification results from the ocean's uptake of carbon dioxide from the atmosphere. Many scientists have become increasingly concerned about the effect industrial emissions of CO2 are having on the chemistry of the world's oceans and about the fallout for many species of marine animals." "No one doubts that carbon dioxide is a greenhouse gas, good at absorbing infra-red radiation. It is also well established that human activity is putting more of it into the atmosphere than natural processes can currently remove. Measurements made since the 1950s show the level of carbon dioxide rising year on year, from 316 parts per million (ppm) in 1959 to 387ppm in 2009. Less direct records show that the rise began about 1750, and that the level was stable at around 280ppm for about 10,000 years before that. This fits with human history: in the middle of the 18th century people started to burn fossil fuels in order to power industrial machinery. Analysis of carbon isotopes, among other things, shows that the carbon dioxide from industry accounts for most of the build-up in the atmosphere. " "Scientists' efforts to defend the integrity of climate studies thwarted by unbalanced media coverage." book review: "The Real Global Warming Disaster"
1) Most of the world's climate scientists, for reasons unspecified, decided to create a myth about human-induced global warming and have managed to twist endless measurements and computer models to fit their case, without the rest of the scientific community noticing. George W Bush and certain oil companies have, however, seen through the deception. 2) Most of the world's climate scientists are incompetent and have grossly misinterpreted their data and models, yet their faulty conclusions are not, as you might imagine, a random chaos of assertions, but all point in the same direction. There's a third option: the world's climate system is hugely complex, hard to predict and constantly surprising; yet in the long term the world is getting warmer, for reasons we basically understand, and there is good reason to believe that humans are mostly responsible for it." "Schools in three US states - Louisiana, Texas and South Dakota - have been told to teach alternatives to the scientific consensus on global warming. The moves appear to be allied to efforts to teach creationism in public schools." "Climate change is emerging as the #1 global sustainability risk driver. RiskMetrics’ Guide to Climate Risk Management provides an overview of climate risk as an investment issue and related solutions." "Climate scientists need to swallow their misgivings and share their data and working methods with their critics. But, in an unexpected turn of events, the [...] committee has placed more blame for the debacle on the university than on the scientists at its Climatic Research Unit [...]"
"Greenpeace is accusing one of the nation's largest conglomerates of sowing confusion around scientific assertions behind climate change, a broadside that comes amid waning public engagement on human-caused emissions." "A new popular sport in some media these days is 'climate scientist bashing'. Instead of dealing soberly with the climate problem they prefer to attack climate scientists, i.e. the bearers of bad news." "'We found absolutely no evidence of any impropriety whatsoever,' said Oxburgh at a press briefing in London today." "An inquiry cleared British climate researchers of wrongdoing on Wednesday after their emails were hacked, leaked and held up by skeptics as evidence they had exaggerated the case for man-made global warming." "In our view the jury is back and the verdict is that cosmic rays and solar irradiance are not guilty for most of the GlobalWarming. Nevertheless, they could be responsible for a contribution and we look forward to future experiments [...]." "Last month was the warmest March on record worldwide, based on records back to 1880, scientists reported Thursday." "He's everywhere on the climate denial circuit. He's not a scientist. He's a classics major and journalist. How is it that he's been able to sell himself to climate deniers as their number one spokesman?" "Climate change is already affecting U.S. and other industrial nations' public health, according to a new government report"
"Geologists refuted on Monday a report which in January had cast doubt on a technology to bury greenhouse gases underground, and on which some policymakers have pinned hopes to fight climate change." "When an ice cube melts in a glass, the overall water level does not change from when the ice is frozen to when it joins the liquid. Doesn't that mean that melting icebergs shouldn't contribute to sea-level rise? Not quite." "Climate change is one of the most urgent problems the world is currently facing. It is commonly agreed that the world’s energy consumption lies at the heart of the problem. In order to deal with the climate problem two types of solutions are proposed, namely mitigation and adaptation." "The Arctic has warmed twice as fast as the rest of the globe thanks in part to melting sea ice, a new study finds"
"Interestingly, recent studies have shown that the size of the ozone hole affects the global temperature. Closing the ozone hole actually speeds up the melting of the polar ice caps, according to a 2009 study from Scientific Committee on Antarctic Research." "To control emissions, countries must first account accurately for their carbon. That will take considerable effort [...]." "Climate change has made nights warmer in India over the past decade, an ominous sign for the nation's vital rice crop." "In this bracing talk, coral reef ecologist Jeremy Jackson lays out the shocking state of the ocean today: overfished, overheated, polluted, with indicators that things will get much worse." " We are deeply disturbed by the recent escalation of political assaults on scientists in general and on climate scientists in particular. All citizens should understand some basic scientific facts. There is always some uncertainty associated with scientific conclusions; science never absolutely proves anything. When someone says that society should wait until scientists are absolutely certain before taking any action, it is the same as saying society should never take action. For a problem as potentially catastrophic as climate change, taking no action poses a dangerous risk for our planet. Scientific conclusions derive from an understanding of basic laws supported by laboratory experiments, observations of nature, and mathematical and computer modeling. Like all human beings, scientists make mistakes, but the scientific process is designed to find and correct them. This process is inherently adversarial—scientists build reputations and gain recognition not only for supporting conventional wisdom, but even more so for demonstrating that the scientific consensus is wrong and that there is a better explanation. That's what Galileo, Pasteur, Darwin, and Einstein did. But when some conclusions have been thoroughly and deeply tested, questioned, and examined, they gain the status of "well-established theories" and are often spoken of as "facts." For instance, there is compelling scientific evidence that our planet is about 4.5 billion years old (the theory of the origin of Earth), that our universe was born from a single event about 14 billion years ago (the Big Bang theory), and that today's organisms evolved from ones living in the past (the theory of evolution). Even as these are overwhelmingly accepted by the scientific community, fame still awaits anyone who could show these theories to be wrong. Climate change now falls into this category: There is compelling, comprehensive, and consistent objective evidence that humans are changing the climate in ways that threaten our societies and the ecosystems on which we depend. (i) The planet is warming due to increased concentrations of heat-trapping gases in our atmosphere. A snowy winter in Washington does not alter this fact. (ii) Most of the increase in the concentration of these gases over the last century is due to human activities, especially the burning of fossil fuels and deforestation. (iii) Natural causes always play a role in changing Earth's climate, but are now being overwhelmed by human-induced changes. (iv) Warming the planet will cause many other climatic patterns to change at speeds unprecedented in modern times, including increasing rates of sea-level rise and alterations in the hydrologic cycle. Rising concentrations of carbon dioxide are making the oceans more acidic. (v) The combination of these complex climate changes threatens coastal communities and cities, our food and water supplies, marine and freshwater ecosystems, forests, high mountain environments, and far more. Much more can be, and has been, said by the world's scientific societies, national academies, and individuals, but these conclusions should be enough to indicate why scientists are concerned about what future generations will face from business-as-usual practices. We urge our policy-makers and the public to move forward immediately to address the causes of climate change, including the unrestrained burning of fossil fuels. We also call for an end to McCarthy-like threats of criminal prosecution against our colleagues based on innuendo and guilt by association, the harassment of scientists by politicians seeking distractions to avoid taking action, and the outright lies being spread about them. Society has two choices: We can ignore the science and hide our heads in the sand and hope we are lucky, or we can act in the public interest to reduce the threat of global climate change quickly and substantively. The good news is that smart and effective actions are possible. But delay must not be an option." A climate sceptic prophesied that we would see ever more papers being published in scientific journals opposing the consensus on anthropogenic climate change. From February 2010 to January 2011 I was randomly checking the science and major news outlets for related publications and studies next to new books. These are posted below. Unfortunately, I cannot see the prophecy being fulfilled. On the contrary, ever more knowledge is pouring in, substantiating the scientific consensus. From a wast array of different fields. However, what I find very positive, is that some scientists are finally taking the rational and legitimate sceptics serious and are addressing their concerns. This has the possibility to refine the filed of climate science. Here are some of the most widespread myths about climate science and arguments why climate change is not a problem, and how they can be refuted. Even Skeptics Admit Global Warming is Real; 18 March 2010"The 2,500 or so scientists, economists and other experts of the U.N. Intergovernmental Panel on Climate Change (IPCC) call global warming "unequivocal" and think it "very likely" that humans have contributed to the problem. The world's governments agree with the panel, which also shared last year's Nobel Peace Prize. As appearing in the June 2010 issue (Vol. 91) of the Bulletin of the American Meteorological Society (BAMS). "For the average United States' city or 'burb dweller, firsthand evidence of climate change is rare. Hunters and anglers see it every day. That's one of the main messages from a coalition of hunting and fishing organizations that released a report Monday outlining the consequences of climate change for fish and wildlife in the United States." "(i) 97–98% of the climate researchers most actively publishing in the field support the tenets of anthropogenic climate change (ACC) outlined by the Intergovernmental Panel on Climate Change, and (ii) the relative climate expertise and scientific prominence of the researchers unconvinced of ACC are substantially below that of the convinced researchers. " "A little extra carbon dioxide in the air may, unfortunately, go further towards warming Earth than previously thought. A team of British and U.S. researchers have uncovered evidence  that Earth’s climate may be up to 50 percent more sensitive to long-term increases in atmospheric carbon dioxide than current climate models predict." Temporal glacier variations are among the clearest natural indicators of ongoing climate change. Continuous efforts in glacier monitoring have achieved long time-series of length variation, mass balance and volume change of glaciers. "Lake Tanganyika, the second oldest and the second-deepest lake in the world, is warmer than it has been in more than 1,500 years, a new analysis released today finds. " "The combined global land and ocean surface temperature was the warmest on record for both April and for the period from January through April, according to the U.S. National Oceanic and Atmospheric Administration, which has records going back to 1880. " "The upper layer of Earth's ocean has warmed since 1993, indicating a strong climate change signal, according to a new international study co-authored by oceanographer Josh Willis of NASA's Jet Propulsion Laboratory, Pasadena, Calif. The energy stored is enough to power nearly 500 100-watt light bulbs for each of the roughly 6.7 billion people on the planet. " So the quote's gradual rise to prominence began. It has now appeared in at least three books, well over 100 blog posts and on around 24,000 web pages. It has become a rallying cry for climate deniers. Yet Houghton never said or wrote those words. His 1994 book usually cited as the source contains no such phrase. The first person to publish them appears to have been Akerman." "They [climate scientists] must realise that they face doubts not just about published results but also about their conduct and honesty. It simply won't work for scientists to continue to appeal to the weight of the evidence while refusing to discuss the integrity of their profession. The harm has been increased by a perceived reluctance to admit even the possibility of mistakes or wrongdoing." "The American survey shows, as such surveys have shown for years, that there is a strong partisan effect on climate-change belief"
"The newest report in the America's Climate Choices suite of studies, Informing an Effective Response to Climate Change, was released Thursday, June 22, 2010. The report examines how to best provide decision makers information on climate change. See the report page for more information. A final overarching report, America's Climate Choices, will build on each of the previous reports to offer a scientific framework for shaping the policy choices underlying the nation's efforts to confront climate change." "The White House says they are." "As you may have noticed, scientists remain convinced that humans are altering the global climate with an excess of greenhouse gas emissions—soot, methane and the ever-present carbon dioxide we pump out from our lungs and coal-burning power plants. The question is: how bad is said climate change going to get?" "A few studies, however, suggest that there may been periods when it was cold when CO2 levels were high, or hot when CO2 levels were low. So what was going on at these times? Are we missing part of the climate puzzle? 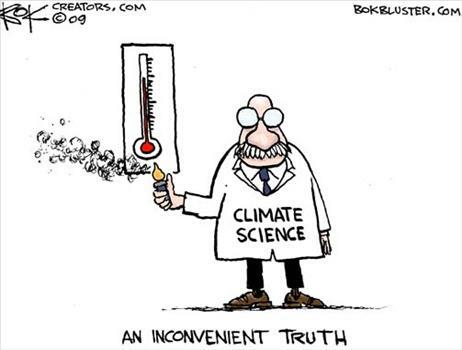 The existence of such inconsistencies no more disproves the idea that CO2 causes warming than your house warming up on a sunny day proves it does not get warm when you turn the heating on - rather, it suggests that some other factor caused the warming." "The echoes of "climategate" rumble on with the publication of a paper in the Journal of Geophysical Research in which some of the researchers involved take issue with a suggestion that greenhouse gases are not primarily responsible for global warming. "Although preliminary estimates from published literature and expert surveys suggest striking agreement among climate scientists on the tenets of anthropogenic climate change (ACC), the American public expresses substantial doubt about both the anthropogenic cause and the level of scientific agreement underpinning ACC. A broad analysis of the climate scientist community itself, the distribution of credibility of dissenting researchers relative to agreeing researchers, and the level of agreement among top climate experts has not been conducted and would inform future ACC discussions. Here, we use an extensive dataset of 1,372 climate researchers and their publication and citation data to show that (i) 97–98% of the climate researchers most actively publishing in the field support the tenets of ACC outlined by the Intergovernmental Panel on Climate Change, and (ii) the relative climate expertise and scientific prominence of the researchers unconvinced of ACC are substantially below that of the convinced researchers. " "It is the third formal inquiry to clear scientists involved in the scandal, which publicized more than 1,000 private e-mails from scientists expressing doubts about their data, refusing to share information and questioning the work of others. Mann is confident these efforts to discredit scientists and undermine climate science will ultimately be judged harshly by history. 'They will continue to attack the science and the scientist," he said. "But I believe that as (the evidence) becomes increasingly compelling, as the public continues to understand that climate change is already unfolding ... we will look back with scorn at those who denied climate change.'" "In truth, climategate was a pseudo-scandal, and the worst that can be said of the scientists is that they wrote some ill-advised things. 'I've written some pretty awful emails,' admitted Phil Jones, director of the CRU at the time. The scientists also resisted turning over their data when battered by requests for it - requests from climate sceptics who dominate the blogosphere and don't play by the usual rules. But there is nothing very surprising, much less scandalous, about such behaviour. Yes, a "bunker mentality" developed among the scientists; they were "huddling together in the storm", in Pearce's words. But there really was a storm. They were under attack. In this situation, the scientists proved all too human - not frauds, criminals or liars. So why were their hacked emails such big news? Because they were taken out of context and made to appear scandalous." "'These results should be alarming,' says Ballantyne. Although it could take centuries for current global temperatures to respond to rising CO2 levels, we can expect the Arctic to warm much more than the rest of the planet, he says." "From heat stress to sewage overflows, climate change promises to bring extreme weather that will challenge the ill-prepared U.S. public health infrastructure." "A 2007 study by the National Oceanic and Atmospheric Administration looked at codfish catch records over four decades. It concluded what fishermen who know this cold-loving fish would have predicted: As the bottom water temperature increased, the probability of catching a cod decreased. Last year, a federal effort to coordinate research, the U.S. Global Change Research Program, found ocean warming already was forcing a migration of some species." "2010 tops 1998 temps; question now is whether 12 months will break 2005 record for warmest year "
" Last month's combined global land and ocean surface temperatures made it the warmest June on record at 61.1 degrees Fahrenheit (16.2 degrees Celsius). That's 1.22 Fahrenheit degrees (0.68 Celsius degrees) higher than the 20th century average of 59.9 (15.5 degrees Celsius)." "Photos taken by a mountaineer on Everest from the same spot where similar pictures were taken in 1921 have revealed an "alarming" ice loss." "Facts don’t necessarily have the power to change our minds. In fact, quite the opposite. In a series of studies in 2005 and 2006, researchers at the University of Michigan found that when misinformed people, particularly political partisans, were exposed to corrected facts in news stories, they rarely changed their minds. In fact, they often became even more strongly set in their beliefs. Facts, they found, were not curing misinformation. Like an underpowered antibiotic, facts could actually make misinformation even stronger." "Civilian researchers have signed an agreement with the U.S. Navy to revive a dormant program that uses the vessels to collect information on parts of the Arctic's ice and ocean that normally lie beyond scientists' reach"
"While polar bears flounder in the face of shrinking ice floes, another furry creature has gotten a boost from climate change. In the past three decades yellow-bellied marmots (Marmota flaviventris) have been fruitful—and multiplied—thanks to longer summers, according to a new study. " "No: the record-breaking heat does not "prove" global warming. Just as extreme winter weather does not prove the world is cooling,"
"It may takes tens of thousands of years for oceans to recover from the acidity caused by increased levels of carbon dioxide"
"The Democratic leadership in the US Senate has suspended efforts to pass a climate change bill. It abandoned not only its planned comprehensive cap-and-trade measure, similar to one already passed by the House of Representatives, but also a more modest bill aimed at electric utilities. The Senate will most likely pass an energy bill of some sort, but this will barely even pretend to make progress on curbing greenhouse gas emissions." "The Climatic Research Unit at the University of East Anglia (UEA) in the UK, recently at the centre of the hacked emails controversy, is launching a pilot study into how best to make public three major temperature data sets and detailed records of how they are processed." "For years, ruthless climate sceptics have harassed scientists, drowning them in freedom of information requests and subjecting them to vicious personal attacks. Climategate was merely the public face of this insurgent war." "Yet more scientific research highlights ongoing climate change--as the U.S. enjoys the hottest July on record." "'Societies are not taking the actions that the science indicates are needed and the technology indicates are possible. It’s important to understand why not,' he says." "A new iPhone climate change sceptics' app inadvertently reveals the strategies of disinformation and denial they employ"
" He said it was not clear if the event was due to global warming. The first six months of 2010 have been the hottest on record globally, scientists have said." "Rice yields threatened by higher temperatures. Study finds daily minimum temperatures rising faster"
"However, it is important to bear in mind that no single weather event can be reliably linked to climate change. "It's a statistical tendency, a push in one direction," says Joanna Haigh of Imperial College London. The Russian heatwave might have occurred anyway, without help from greenhouse gases. All we can say for sure is that such events are more likely in a warmer world." "Ice cores extracted in June from one of the last tropical glaciers in the Pacific recently arrived in the United States, where researchers will spend the coming months scrutinizing their every detail." "Solar physicists may have discovered why the Sun recently experienced a prolonged period of weak activity. The most recent so-called 'solar minimum' occurred in December 2008. Its drawn-out nature extended the total length of the last solar cycle — the repeating cycle of the Sun's activity — to 12.6 years, making it the longest in almost 200 years. The new research suggests that the longer-than-expected period of weak activity may have been linked to changes in the way a hot soup of charged particles called plasma circulated in the Sun." "As the Arctic melts due to climate change, its iconic marine mammals are feeling the heat. The Arctic Ocean held less sea ice in June of this year than any previous June on record. For the last four summers, the ice melt has exceeded what even pessimistic climate models predicted only a few years ago." "Read year-round scientific analysis and see daily image updates of Arctic sea ice." "Better information is needed to fashion the management that will sustain fisheries, conserve diversity, reverse losses of habitat, reduce impacts of pollution, and respond to global climate change." "Climatic change will reach the deep sea considerably later than other marine environments, but the effects of bottom temperature and the productivity of the surface waters on the environmentally sensitive fauna that live there are expected to be dramatic. CeDAMar will provide a foundation of knowledge about faunal composition, seasonal variations, and the influence of productivity in the deep sea on which any future study of the effects of global warming or human interference will have to rely." "Protect Our Winters is the environmental center point of the winter sports community, united towards a common goal of reducing climate change's effects on our sport and local mountain communities. We believe that to really effect things, consumer behavior needs to change and that the power of an actively participating and united community can have a direct influence on climate change, now and for generations behind us." "She did not necessarily agree with the criticisms, but rather than dismissing them, as many scientists might have done, she began to engage with the critics. It was here that Curry began to develop respect for climate outsiders—or at least, some of them. And it made her reconsider her uncritical defense of the IPCC over the years. Climate skeptics have seized on Curry’s statements to cast doubt on the basic science of climate change. So it is important to emphasize that nothing she encountered led her to question the science; she still has no doubt that the planet is warming, that human-generated greenhouse gases, including carbon dioxide, are in large part to blame, or that the plausible worst-case scenario could be catastrophic. She does not believe that the Climategate e-mails are evidence of fraud or that the IPCC is some kind of grand international conspiracy. What she does believe is that the mainstream climate science community has moved beyond the ivory tower into a type of fortress mentality, in which insiders can do no wrong and outsiders are forbidden entry. "Over 100 freshmen Republicans were elected to the 112th Congress. According to an investigation by ThinkProgress, a progressive blog, 50 percent of the GOP class of 2010 deny the existence of manmade climate change, and 86 percent are opposed to any climate change legislation that increases government revenue." "The troubling story of how a cadre of influential scientists have clouded public understanding of scientific facts to advance a political and economic agenda." 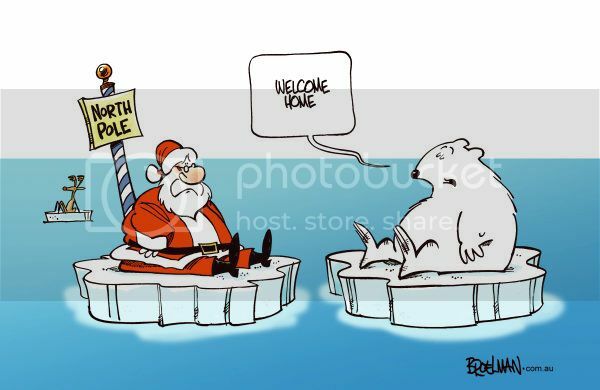 "The polar bear is the poster child for species threatened with extinction by climate change. But a new study finds that the Arctic animals may get a reprieve in the form of an abundant supply of eggs from snow geese." "Most scientists have assumed that, as carbon dioxide levels increase and the Earth warms, plant species diversity in the rainforests will start to dwindle, with plants unable to adapt to the heat. But a new study suggests that the opposite may be true. In the past, rising atmospheric carbon dioxide and higher temperatures actually drove the evolution of far greater numbers of new rainforest plant species than were wiped out. But don't trade in your electric car for a gas-guzzler just yet--if rainfall drops as temperatures rise, or if they rise too rapidly, the outcome for rainforest diversity could be much less positive." Google has unveiled Google Earth Engine, "a new technology platform that puts an unprecedented amount of satellite imagery and data — current and historical — online for the first time. It enables global-scale monitoring and measurement of changes in the earth’s environment." They're also "donating 10 million CPU-hours a year over the next two years on the Google Earth Engine platform, to strengthen the capacity of developing world nations to track the state of their forests, in preparation for REDD. For the least developed nations, Google Earth Engine will provide critical access to terabytes of data, a growing set of analytical tools and our high-performance processing capabilities." "Many scientists use the climate year, which runs from December of the preceding year to November of the current year, to evaluate long-term climate trends. The combined land-ocean temperature readings NASA's Goddard Institute posted Friday indicate that 2010 has surpassed what it identified as the previous warmest climate year, 2005." 2010 was the year of the heatwave, with record temperatures set in 17 countries. Two leading groups of scientists say it was the warmest since records began in 1850; another suggests it was the second-warmest." " No matter how you crunch the data, 2010 is certain to go down in history as one of the warmest — if not the warmest — years since the beginning of instrumental records in the late 19th century. This is despite the recent cold and snowy weather in much of the U.S. and across Europe." "Climate contrarians have been making much of an article published on 20 March 2000 – the last day of winter – with the headline: 'Snowfalls are now just a thing of the past.'" "It's likely that the number of strong storms involving rain, snow and hail is also rising because of warming temperatures, not just urban sprawl and expanding development." "Global surface temperatures in 2010 tied 2005 as the warmest on record, according to an analysis released Wednesday by researchers at NASA's Goddard Institute for Space Studies (GISS) in New York." Provided global warming exists, what strong evidence exists against it being caused by humans? Provided global warming exists, what strong evidence exists in support of it being caused by humans? "A North Atlantic current flowing into the Arctic Ocean is warmer than for at least 2,000 years in a sign that global warming is likely to bring ice-free seas around the North Pole in summers, a study showed." Taking a closer look at the contrarian claims and assertions by popular and influential climate sceptic Lord Christopher Monckton in the blog post the status of climate scepticism. Unnoticed by the public, climate scientists continue doing their job, monitoring and researching climate change. Albeit with a new twist: it has been realized, that also human psychology needs to be thrown into the, already very interdisciplinary, mix. Not only the hard science matters, but crucially also subtle issues, like clarifying, constraining and communicating uncertainty. To this aim, the prestigious Nature Publishing Group has issued a new journal: Nature Climate Change, augmenting the physical climate science with insights from social science research. Read the editorial here. Meanwhile, in the climate sceptic camp, Lord Christopher Monckton, 3rd Viscount Monckton of Brenchley, has been getting a lot of media attention. He is a prolific, hugely popular and very influential climate sceptic. The central question is this. It's not whether CO2 or other greenhouse gases can cause warming, because we've known for 200 years that they can. It's not whether we are causing the CO2 in the atmosphere to rise, because we are. The only question that really matters is, given the rate at which we are adding CO2 to the atmosphere, how much warming will that cause, if it continues [i.e., climate sensitivity]. It is important to understand the difference between forcing and sensitivity because, as we will see in a minute, Monckton gets them completely mixed up. In December , just weeks away, at Copenhagen, a treaty will be signed, that will, for the first time, create a world government [...]. And then 18 moths ago I cured myself with an invention which shows much promise. We're curing people of everything from HIV to malaria to multiple sclerosis. More on climate change in the blog post a climate of confusion.